A young wife and mother experiences something she cannot explain, and her discovery energizes various competing factions—religious leaders, climate scientists, environmentalists, politicians—trapping her in the center of the conflict and ultimately opening up her world. The word ‘rapture’ appears on the very first page of Flight Behavior. 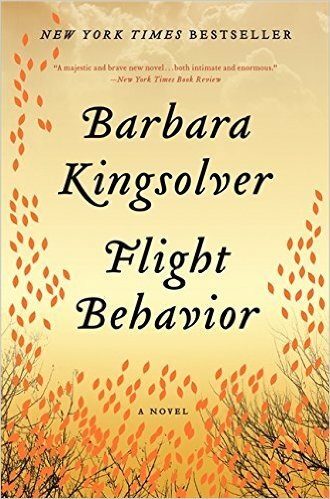 This is appropriate, for the novel extols the ecstasy of passionate engagement — with people, ideas and the environment … Kingsolver takes us deep inside her smart, appealing protagonist's underprivileged world of free school lunches and soul-sapping secondhand stores. Despite her lack of worldly experience, Dellarobia is acutely aware of her family's Appalachian hillbilly status. Kingsolver highlights social stratifications in often comic scenes … Earnest conversations between Dellarobia and Ovid about the direness of environmental conditions sometimes make us feel as if we've wandered into a sophomore seminar, but it's impressive that Kingsolver doesn't sugarcoat the sobering facts of climate change or the heartbreak of a marriage between two good people who are wrong for each other. What did you think of Flight Behavior?